This is what’s left of one of Laie’s landmarks. I was on my way home from a photo shoot and decided to jump out and snap a shot as this little inn came down. When I set up my tripod to take some shots, I was surprised when my van was surrounded by 4 cop cars. I asked what was going on and they said they had received a call that a guy was loading a gun in his van across from Laie Inn. Either someone mistook my camera for an assault weapon, or someone didn’t want me taking the photos, or someone was playing a practical joke. I don’t know, but it made for an adventurous photo op. Love the photo, was surprised myself when I drove by, your pic reminds me of “Are You My Mother” childrens book! That photo is amazing! I was just passing the same spot today thinking I should jump out and take some pics of what use to be my childhood playground! I love the story.. glad i read before i jumped out and tried to take my own pics! RIP Laie Inn. You know all those roaches went right next door to McDonalds…. or the Alii buffet! Great photo though- you are a master. 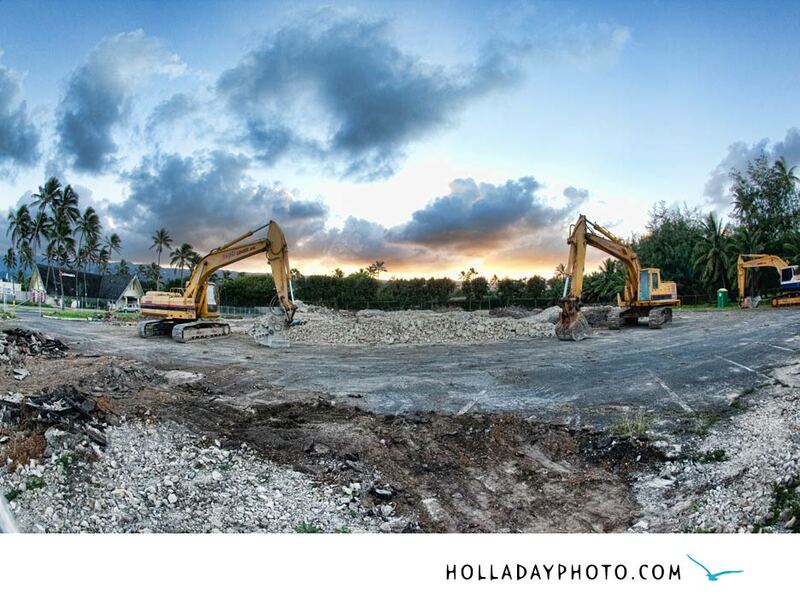 MAHALO, Mark, for going the extra mile in taking this absolutely amazing picture of Laie Inn’s last moments.